Get to know the dinosaur known as Specimen FMNH PR 2081. You may know SUE as the hilarious, pun-loving dinosaur turning Twitter into a personal smorgasbord. Or you might treasure that selfie you snapped with this fearsome fossil looming overhead. But there’s a lot more to SUE’s story than 280 characters or a passing glance might offer. This specimen has been invaluable to the paleontological community since its discovery. And before settling into the luxurious life of a well-kept Chicago museum attraction, SUE had quite the history! SUE’s actual gender is unknown; this T. rex is named for Sue Hendrickson, who discovered the dinosaur in 1990 during a commercial excavation trip north of Faith, South Dakota. Hendrickson spotted a few large vertebrae jutting out of an eroded bluff and followed her hunch that there were more beneath the surface. In the end, it took six people 17 days to extract the dinosaur’s bones from the ground where SUE was discovered. Susan Hendrickson stands near her discovery. After excavating the fossilized bones, collectors wrapped the bones in protective plaster field jackets to remove them from the site. How did SUE get to the Field Museum? Shortly after Hendrickson’s landmark discovery, three parties embarked on a five-year custody battle that ended in a public auction in 1997. The highest bidder? The Field Museum (with support from McDonald’s Corporation, the Walt Disney World Resort, and private donors), at a staggering $8.4 million—the most money ever paid for a fossil at auction. SUE finally made a dramatic debut in Stanley Field Hall on May 17, 2000, but there was a lot of work to be done to get the skeleton there. 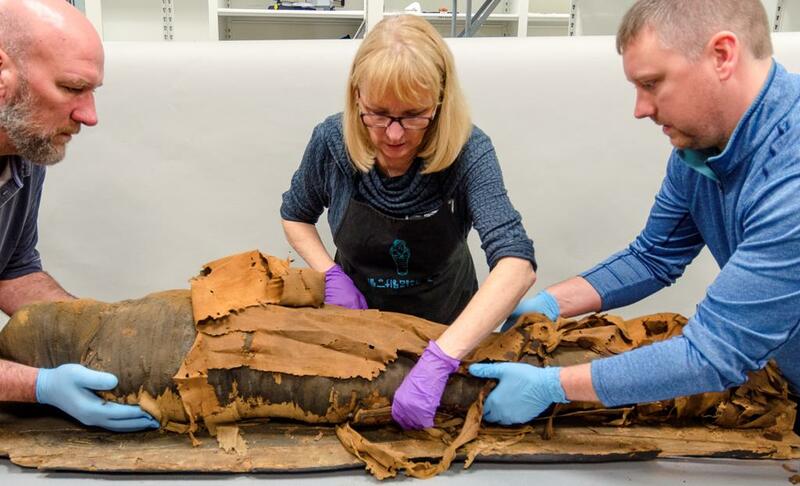 After SUE was purchased at auction, 12 museum preparators spent more than 30,000 hours preparing the skeleton (plus another 20,000 hours building the exhibit). Why is SUE so important? At more than 40 feet long and 13 feet tall at the hip, SUE is physically the largest Tyrannosaurus rex specimen discovered, out of more than 30 T. rex skeletons that have been found. SUE is also the most complete—around 90 percent. We have 250 of the approximately 380 known bones in the T. rex skeleton, including the furcula (wishbone) and gastralia (a set of rib-like bones stretched across the dinosaur’s belly, believed to have helped SUE breathe). 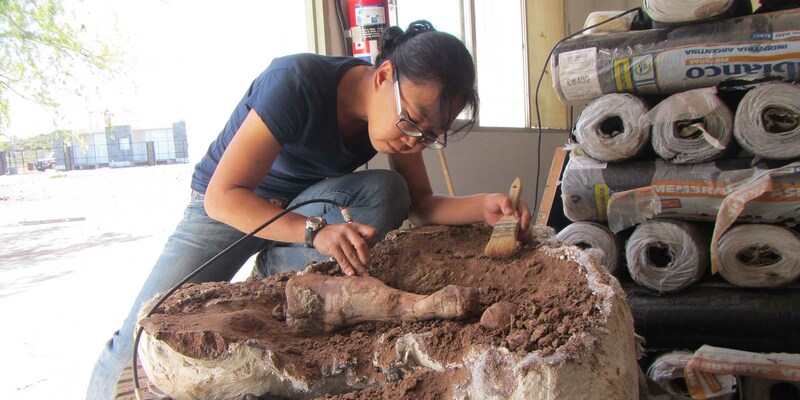 Copies of SUE’s skeleton were created from molds made by our preparators. These casts were made for a variety of purposes. One complete skeleton is stored unassembled in our research collections for further study by visiting scientists. Others were assembled into mounted cast skeletons, which travel to museums and science centers around the world for international dinosaur lovers to marvel at. All that expense and hard work has been well worth it: SUE is the most celebrated representative of T. rex and arguably the most famous fossil in the world. SUE has enabled scientists all over the world to do more detailed studies of the species’ evolutionary relationships, biology, growth, and behavior than ever before. SUE lived in the Late Cretaceous period, depicted here in a painting by John Gurche. SUE has taught scientists about biomechanics and movement, dinosaurs’ intellect, and even how much SUE weighed, says Peter Makovicky, the Field Museum’s curator of paleontology. Other fossils discovered during the same excavation can also tell us about the environment SUE lived in, what the dinosaur ate, and more. For example: How did T. rex use their arms? In 2016, one of SUE’s tiny forelimbs took a solo field trip to Argonne National Laboratory in Lemont, Illinois, where researchers took micro-CT scans of the arm to produce high-resolution images of its interior. Those scans allowed us to get a look at SUE’s bone structure—and study how our favorite dinosaur used its arms. SUE’s skull alone has fascinated researchers for decades. SUE’s skull is displayed separately from the rest of the skeleton, allowing scientists easier access. On February 5, 2018, we began disassembling and removing SUE from Stanley Field Hall. But your favorite dinosaur isn’t being retired. SUE’s getting a fancy new home: a dedicated suite in Griffin Halls of Evolving Planet. During SUE’s time out of the public eye, our scientists are making important scientific updates to this fearsome fossil. We’ll add SUE’s gastralia to the rest of the skeleton, and in keeping with research that has emerged since SUE was mounted in 2000, we’ll also lower the arms and install the bone we now know to be SUE's wishbone. SUE’s bones have taught us so much about Tyrannosaurus rex since the 2000 unveiling—we can’t wait to find out what scientific discoveries this colossal skeleton will lead us to next. 12.21.18 update: See SUE on display in their permanent home in Evolving Planet. You’ll find the gallery after making your way through the Genius Hall of Dinosaurs—that’s a right turn after the triceratops. SUE the T. rex is part of the Griffin Dinosaur Experience, made possible by the generous support of the Kenneth C. Griffin Charitable Fund.